Mrs Hudson’s Christmas Corker features (l-r) Spymonkey founders Toby Parks, Aitor Basauri and Petra Massey alongside Sophie Russell. Let’s look at the evidence. 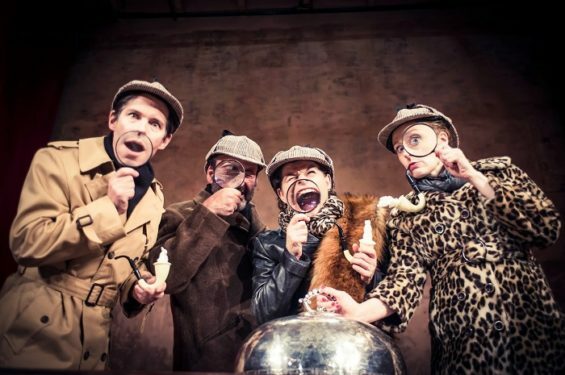 Mrs Hudson’s Christmas Corker features all three founders of the ever-superb Spymonkey larking about with none-too-drab Sophie Russell. The script is co-written by Barry Cryer, a deft wit heard and seen on various radio and TV shows over the last few decades. The show is an old school Victorian music hall show staged in one of London’s best-preserved remaining music halls. We don’t need Mrs Hudson’s most famous tenant to deduce that we have all the makings of a genuine corker here. The script sees Sherlock Holmes (played by Toby Parks) and his assistant (Aitor Basauri) tackle a trio of cases with the aid of their landlady (Russell) plus Petra Massey as an ancient neighbour. The storyline sees them all travel through time and space as while trying on different outfits and characters for size. Fans of Spymonkey shows like Cooped or Oedipussy won’t be disappointed. There’s enough well-executed slapstick and brilliant physical comedy to laugh half of East London to death. At times, the show is filth than a fatberg. And at least one of the Spymonkey crew exposes themselves to the general public. Sophie Russell was recently seen at the Royal Court playing an anarchic housewife alongside Anna Chancellor and here she fits right into the general zaniness. There really is rarely a dull moment. Exposition is kept to a minimum and the action rolls from one madcap scenario to another. Before they’re done, the quartet recover a rare diamond, travel to Bethlehem to meet Josesph and Mary and we get to meet God and his bisexual buddy Gabriel. Although the production comes in at about 2 hours long, there’s never a sensation that a scene could be cut. Despite the far-fetched antics, Mrs Hudson’s Christmas Corker never loses sight of its music hall framing. As well as the standard panto-style call and response, there are songs and a wafer-thin fourth wall which allows for more than the odd nudge and wink towards the audience. If the production has a weak spot, it is the script which contains a few misfires and one of the most overused gags ever. Thankfully, the effervescent cast in the main steamroller over these deficiences with ample aplomb. For those looking for something cheekier and crazier than the average panto, Mrs Hudson’s Christmas Corker is the perfect treat.